Synthetic Biology challenges have only real sense taking into account the effect it has on the improvement of nowadays issues. However, it is also one of the most controversial scientific fields for the public opinion. Currently, access to Synthetic Biology field is hampered by several barriers, such as the necessity of deep technical knowledge and high-cost technologies. In the same way, the presence of common misconceptions in regard to bacteria handling and genetic engineering makes it even more difficult to reach to the general public. Thus, our aim is to break down all these barriers in order to increase SynBio accessibility into society. To do so, we have created Printeria: a bio-engieering device capable of automating the process of printing genetic circuits in bacteria. Under the core values of affordability and reproducibility, Printeria is a compact device with which SynBio can be approached to the public in an innovative, friendly and reduced-cost way. Thus, Printeria has been conceived as both and educational and bioartistic tool. With a user-friendly software, it can introduce SynBio into the high school classrooms without the necessity of lab equipments. In the same way, it offers a wide range of opportunities for the bioartist disposal. To prove its social usefulness, we have explored Printeria impact possibilities into society. Art exists since the origins of humanity. Likewise, science has always been prompted by a desire of knowing more and more about the world, the nature and life. While developing Printeria, we had the chance to get into the vast applications of the BioArt world: a contemporary art form that adapts scientific methods and biotechnology to explore living systems as artistic subjects (1). As a consequence, we realized we needed to explore the existant synergy between art and science by getting into the BioArt ways of expression. While creating our Printeria Part Collection, we wanted to provide bioartists with a complete DNA toolkit for their artwork production. 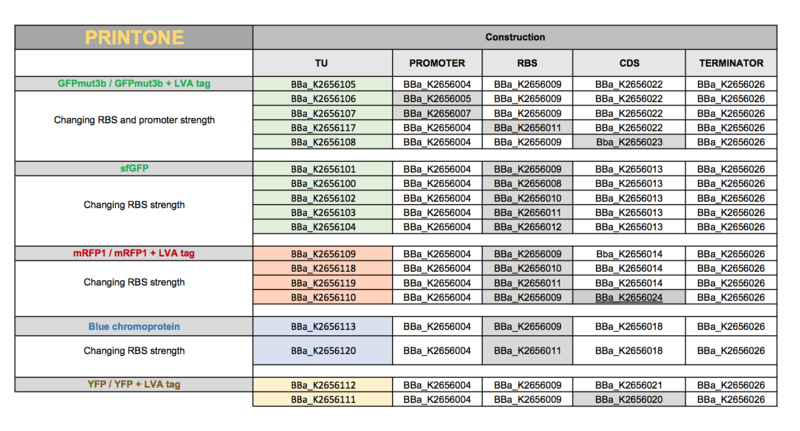 To do so, we assembled several transcriptional units with our different colour reporters (GFPmut3, sfGFP, YFP, mRFP1, amilCP ) and a variety of promoteres and RBS to get different tones. 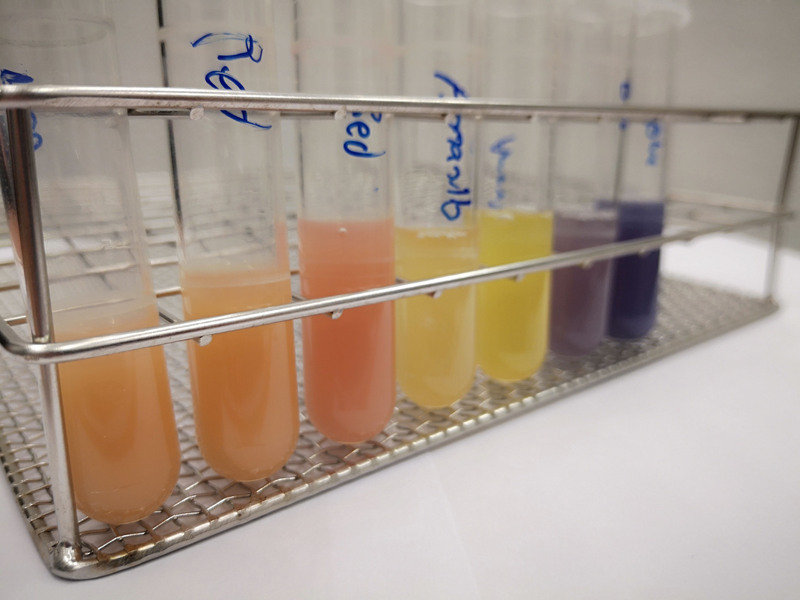 By this way, we finally obtained Printone: a palette of pigmented bacteria, with different colours, fluorescence and intensities, for the entire disposal of the bioartist creativity. Thanks to the information gathered as part of our Integrated dialogue with artist professionals, such as María Peñil and his collegue Mehmet Berkmen, we decided to explore the Microbial Art field: creation of masterpieces with microbial living cells such as bacteria. 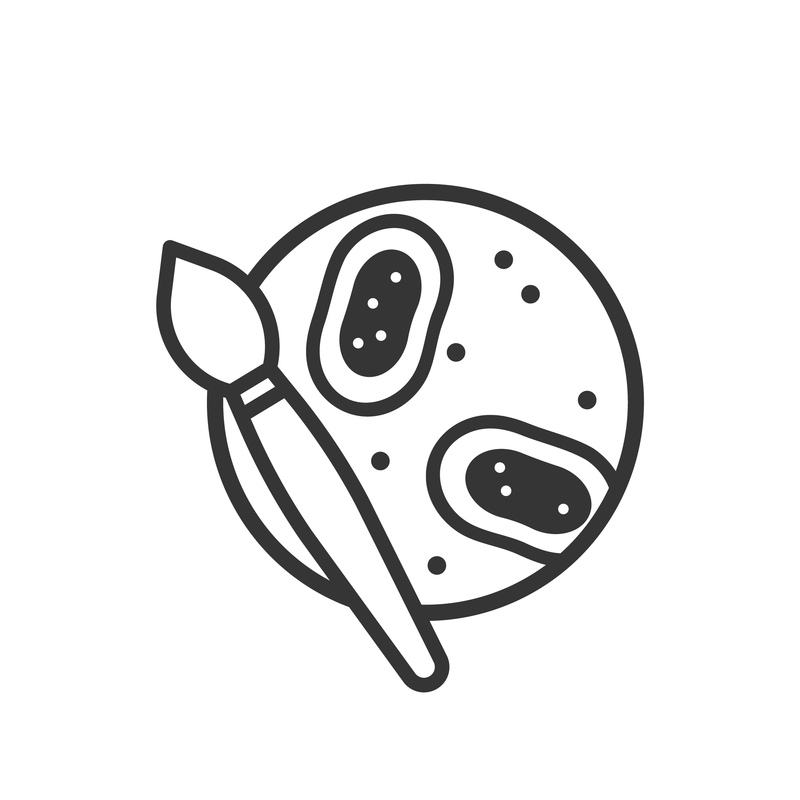 Thus, we used our palette to introduce, both ourselves and the general public, to the Microbial Art. As María advised us, we tried several inoculating techniques to draw, such as directly pippeting liquid medium or using inoculating loops, to choose these that better fitted with the desired results. Indeed, we even sent some of our Printone samples to María and Mehemet, as they were interested in testing the use of our genetic engineered bacteria to paint their own artworks. 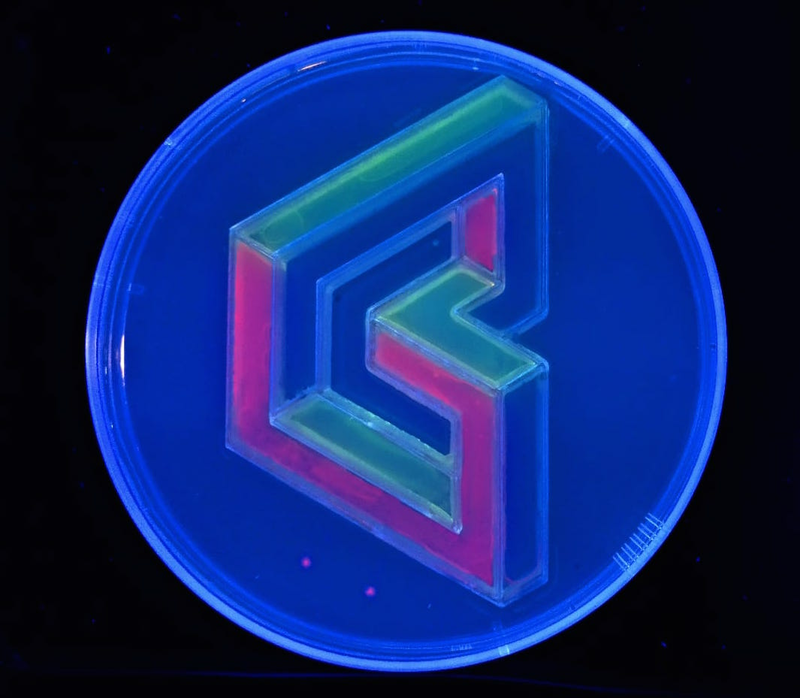 Commonly, genetic engineered bacteria bright much more than natural strains, and some of them even express fluorescence, so the artistic possibilites are extended with this kind of microorganism. Images 2 and 3. 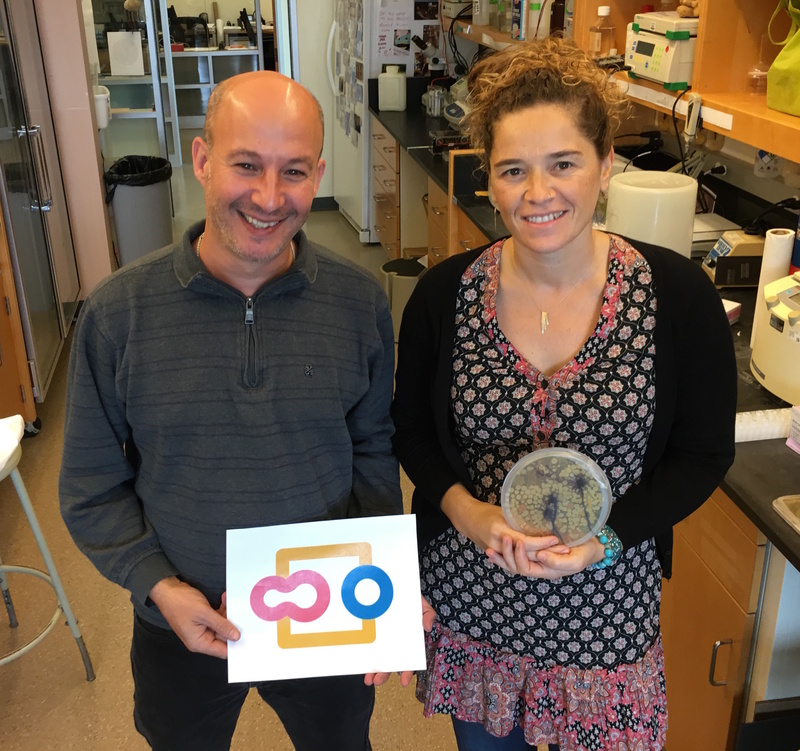 PhD Mehemet Berken and María Peñil holding Printeria's logo. You can also see our own Printeria logo painted in the lab. How to attract people to SynBio? It is possible to achieve this challenge in a subjective and eye-appealing way? 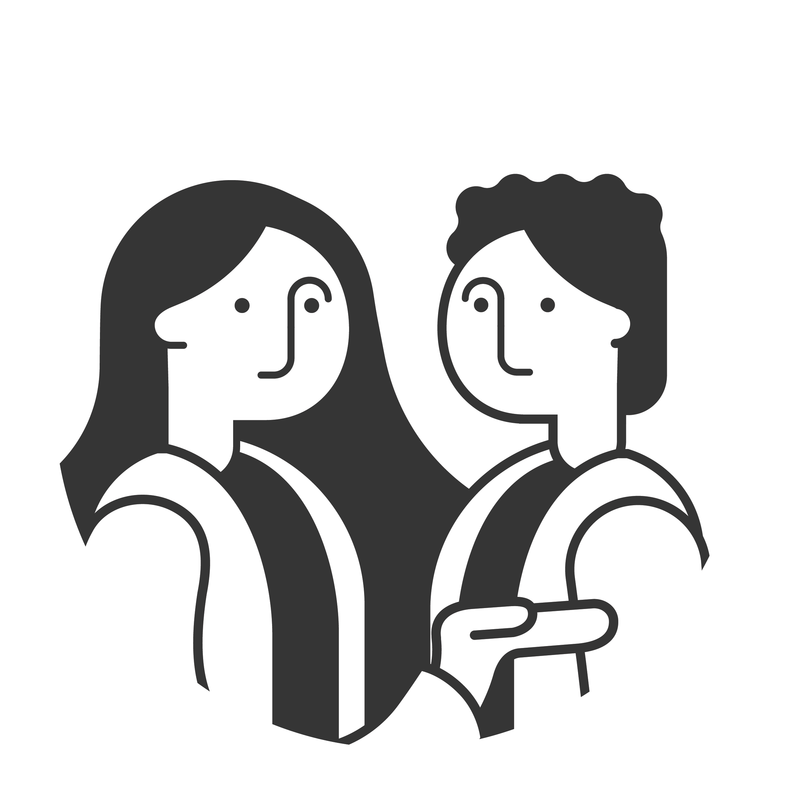 While developing Printeria, we realized we had there the perfect way to approach SynBio to the non-researcher world. Thus, we organized the workshop ‘Bioartist for one day’, in which we demostrated that Printeria living products could be used to create authentic artworks. The activity took place in the Mustang Art Gallery (Elche), a cultural space dedicated to the diffusion of contemporary art. This workshop involved last year high school students of arts, science and social sciences, so we could interact with a wide range of different profiles. In this activity, they created their own ‘living masterpice’. Previously, we did detailed explanation on how to properly use the lab material during simple microbiology protocols. Thus, they learned both from the art and microbiology worlds. 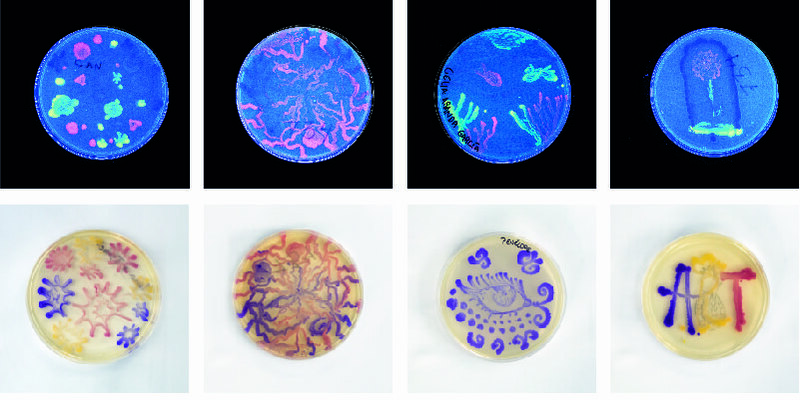 Then, using solid agar plates as a canvas, inoculating loops as brushes and the palette of pigmented bacteria we self-made in the lab as tempera, they blew their minds to do imaginative Microbial Art. As soon as they finished, petri dishes were collected and kept for a later incubation in our lab. Finally, a gallery of all their beutiful works was published in @printeriaupv Instagram profile, so everyone could share them and create interest into the Bacterial Art. As a conclusion, this workshop was a total success, and both the public and ourselves were delighted to realize the beauty of the microbial world and its simple but yet appealing applications. José María Yturralde is an spanish artist widely known for his relationship with science. He collaborated with artists and scientists to redefine his understanding of shapes, and explored ways that the mainframe computer could be used as a tool for his art (2). In this context, we thought it could be a great idea to introduce him to the vast possibilities of the BioArt, and so learn about his life experiences all at once. We introduced our attendee into the basics of the synbio and the microbiology protocols. We also disscused the necessity of integrating both art and science, in order to broaden the social art perception. Finally, after showing him our laboratory facilities and the way to safetely handle lab material, he finally was eager to try by himself the creation of agar art. Moreover, as part of this outreach collaboration, we decided to recreate one of his masterpieces, from the well-known collection 'Impossible Figures', with our own genetic engineered bacteria. To do so, we printed a 3D mold to delimitate the barriers of the drawing, so we could inoculate each coloured bacteria in a compartiment of the solid agar medium. Finally, using bigger than usual agar dishes, we were able to recreate his artwork. After several trials with different colour tones and molds, the final result was perfect. Images 9-10. Yturraldes's masterpiece and our final Microbial Art version under UV light. High school students are eager to know more about the world they live in. 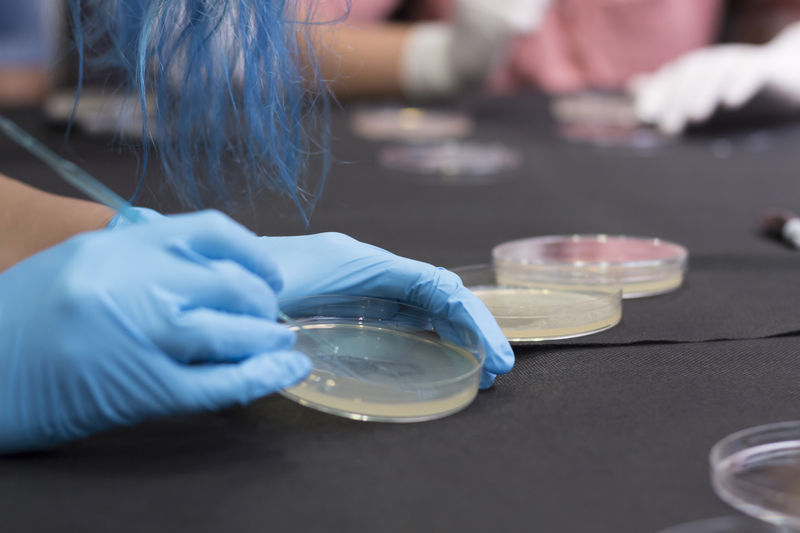 However, students rarely learn about Synthetic Biology inside classrooms. As there is a lack of hand-on STEM curricula, basic concepts such as gene, DNA and bacteria are only explained theoretically. In order to stimulate young people to be curious about science, we decided to do our part in changing this educational approach. 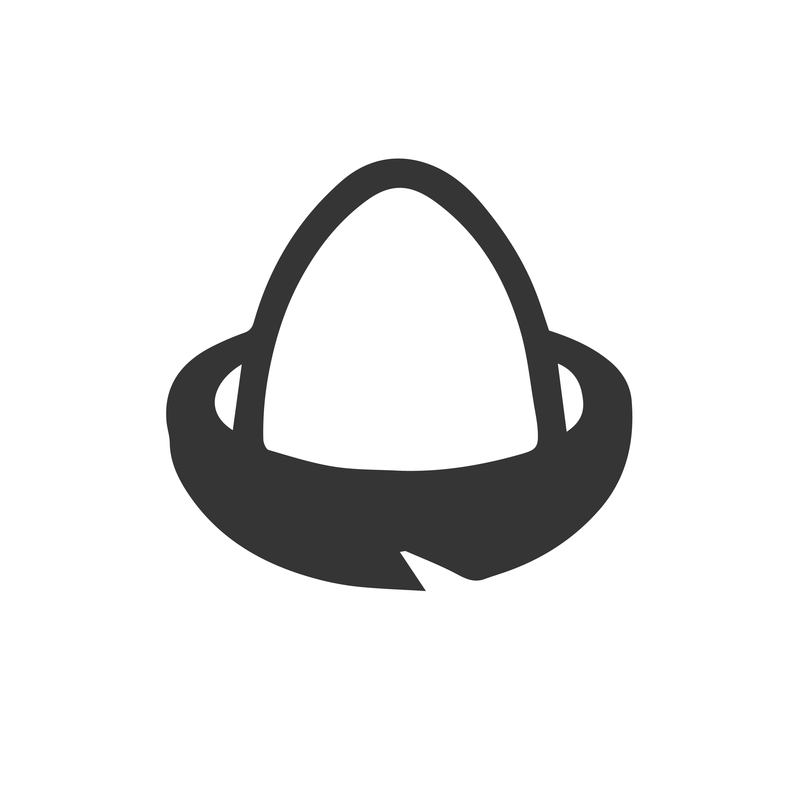 Printeria: how it really works? As SynBio is not only about biology, we thought it was highly important to demonstrate the role of engineering and electronics. Thus, we decided to explain them the basis of Printeria: how the digital microfluidic system allows us to control each biotech process with high accuracy. 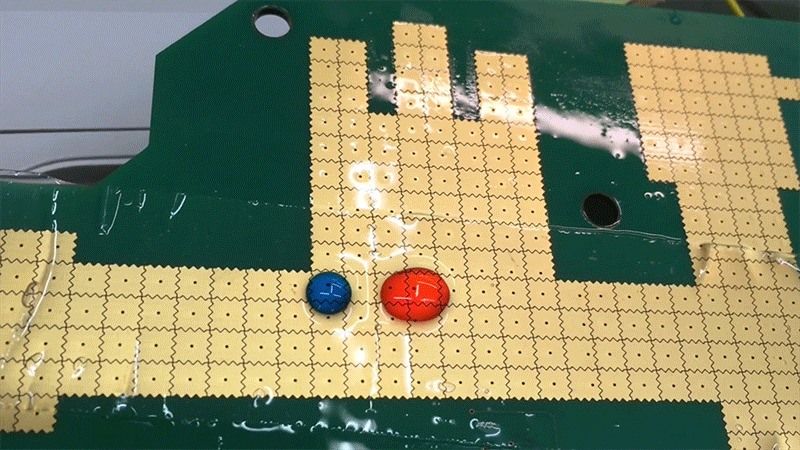 They were able to life in first person the droplets controlled movement around our PCB surface. Moreover, we showed several videos to ensure they could understand such kind of a priori complex concepts. 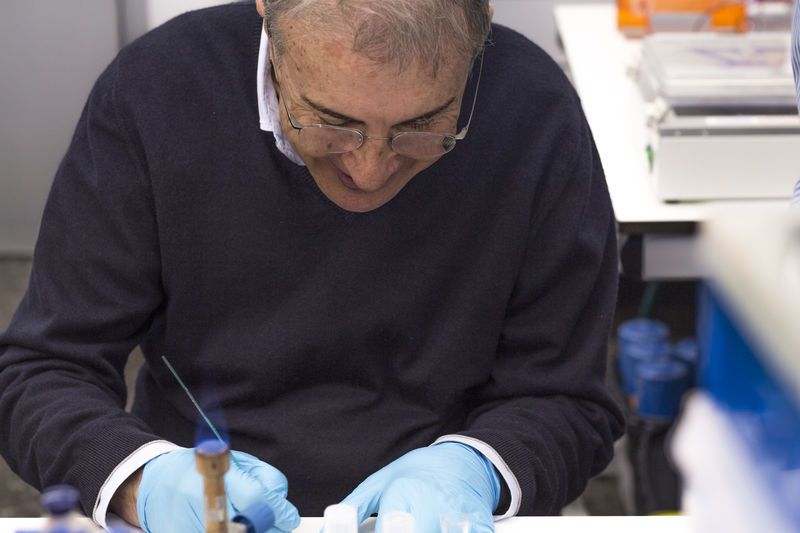 As a result, many of them finished the activity being completely interested in learning more about the microfluidic technology and its future applications. 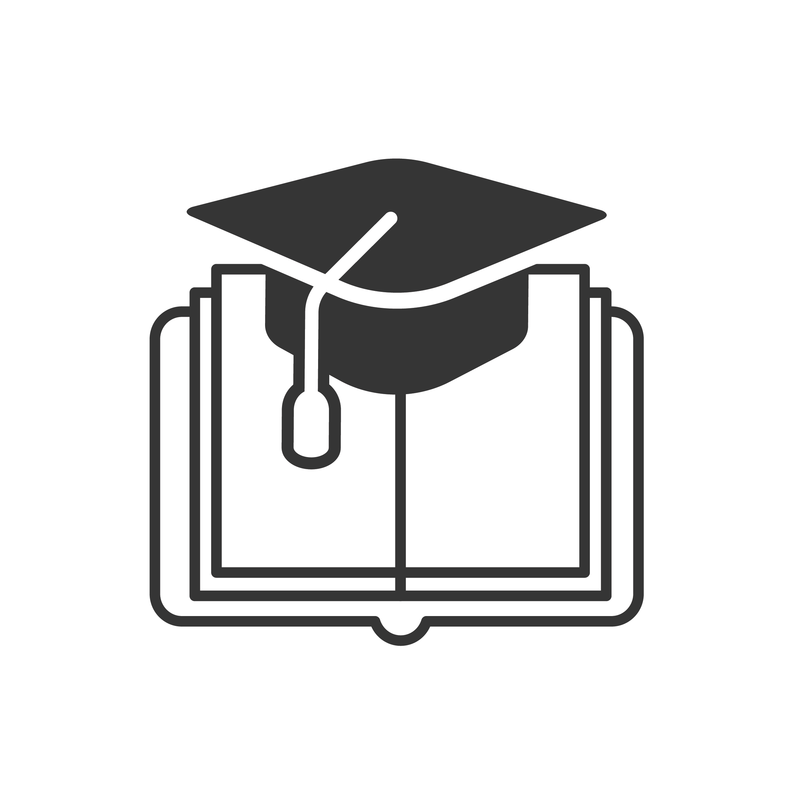 Printeria aim is to be used as an educational tool. 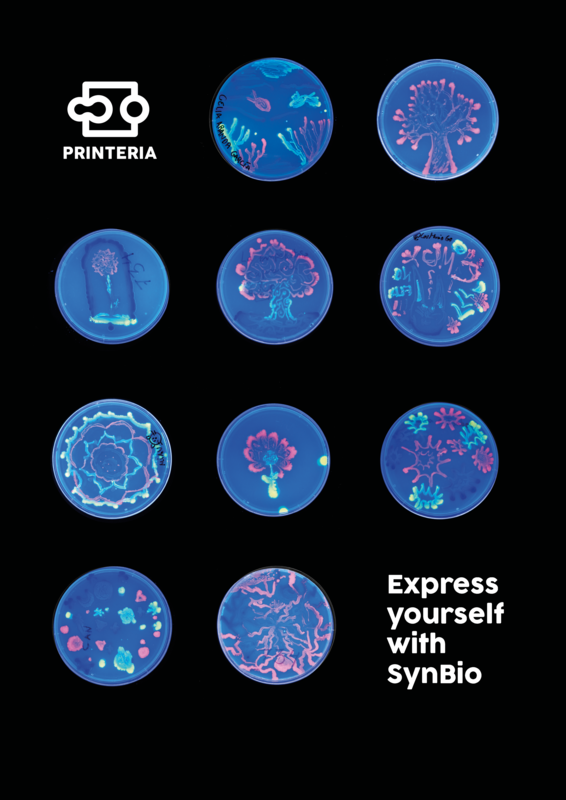 Taking into account that, generally, people doesn't even know what SynBio, we realized it was necessary to ensure students could use Printeria in a friendly but at the same time technically correct way. The European Research Night is a wide-public event, promoted under the EU Programme Horizon 2020, whose objective is to to encourage the scientific vocations and lay public interest into science. 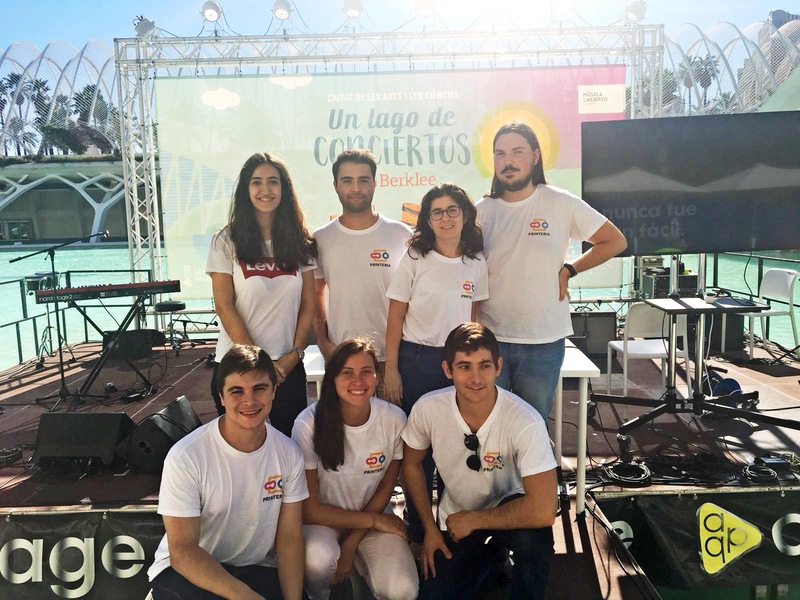 As part of this event the City of Arts and Science, one of the biggest scientific and cultural leisure complexes in Europe, organized a complete program of free access activities. 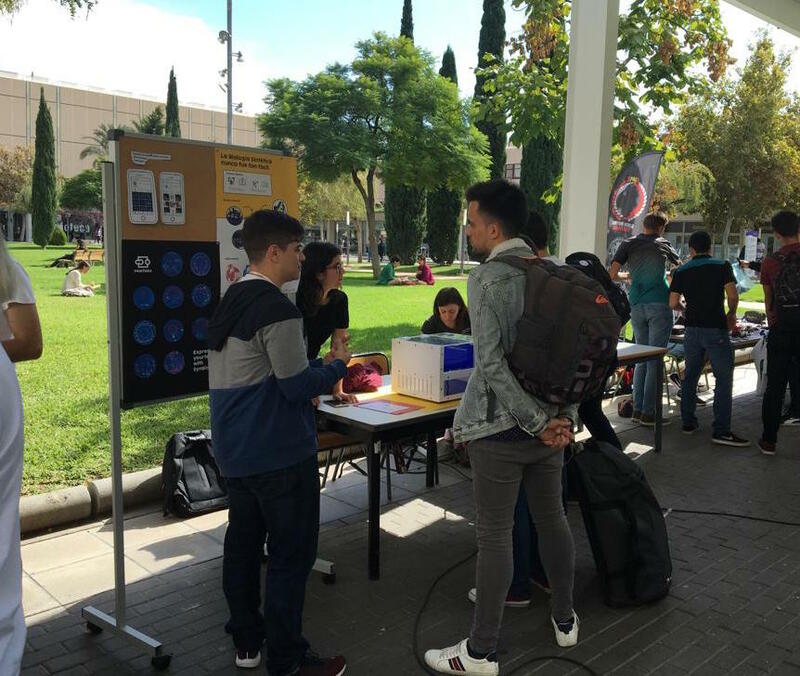 We were invited to be part of this program, so we decided to present there Printeria future applications to a public from different ages, who dialogued with us about common synbio misconceptios. 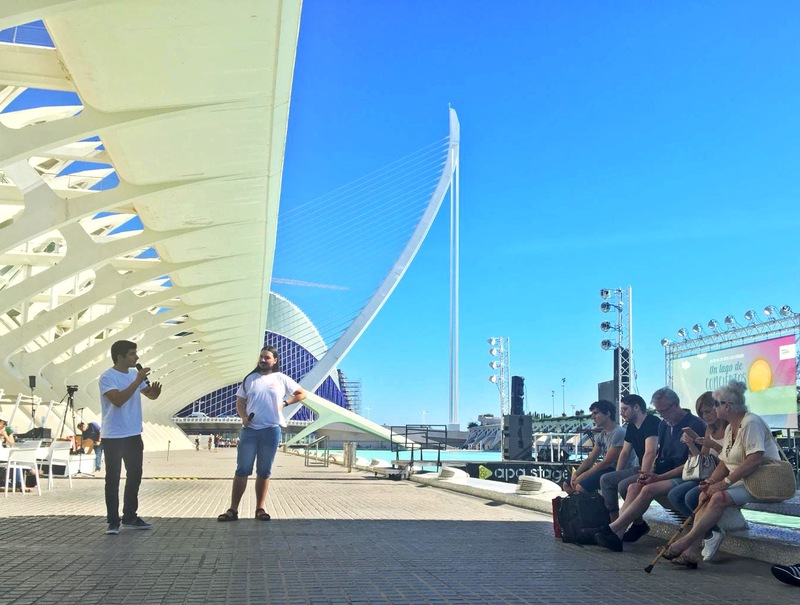 UPV_iGEM is part of the Design Factory Global Network, a network of universities innovation hubs whose mission is to create change in the world of learning through passion-based culture. As part of the Design Factory Exhibition, we had the chance to show Printeria to all the university community and so introduce the basic concepts of SynBio to those who didn't know about them. We included some visual divulgation posters to attract their attention, such as this one or this BioArt compositions. This was a worthy experience, as many university students were interested in knowing more about SynBio once listening about this year project. 2. 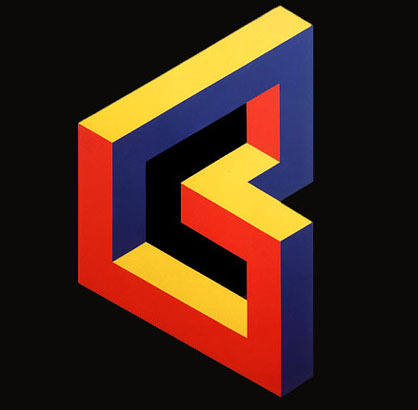 Bravo, E. G. & García, J. A. (2015). Yturralde: Impossible Figure Generator. Leonardo 48(4), 366-374. The MIT Press. Retrieved October 8, 2018, from Project MUSE database.